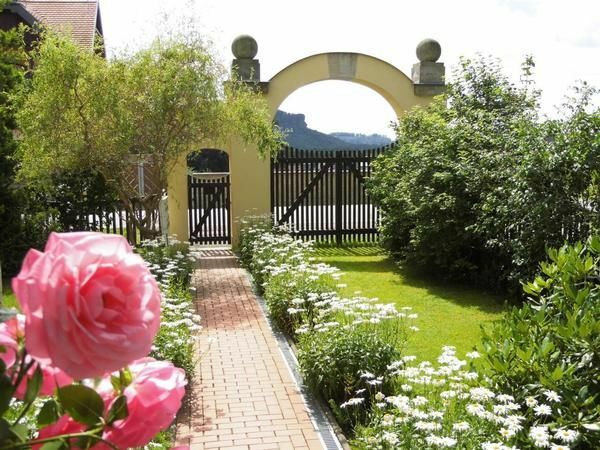 This apartment is located on the first floor of a private house in Waltersdorf, a district of the spa town of Bad Schandau, which is centrally located in Saxon Switzerland. Due to its location on the south / west side of the listed building offers the 60 square meter apartment with balcony rooms flooded with light and thus all day a pleasant living environment. The apartment is divided into kitchen, living room, bedroom and bathroom and is set up for two people. The living room is next to the seating area yet a comfortable sitting area for two, perfect for relaxing or reading. For a child, the couch with sleeping function (lying area 90 x 220 cm) in the living room can be made available as an extra bed. The bedroom (90 cm x slabs 2 x 200 cm) equipped with a built-in wardrobe and a double bed. The bed has adjustable slats for headboard and footboard. The bathroom offers a tub with shower and a shower. The kitchen has a dining area and is equipped with all necessary appliances such as stove, refrigerator, microwave, dishwasher and coffeemaker. The Internet access is possible via WLAN. A heater is available in all rooms. Outside, for relaxing hours, a separate seat is in the garden, which is directly adjacent to the conservation area, furnished. A barbecue can be provided upon request. Directly at the house in the property there is a free parking. Not far from the site there is a shop and a playground with a football pitch and a restaurant. The nearest grocery store with snacks is located in about 100 meters distance. The next supermarket is about five kilometers away. - Local tax / tourist tax: per person and day costs of 2 EUR (optional). Internet (per property per day, included 0 EUR). Tourist tax (per person per day, to be carried out by the tenant 1 EUR). Tourist tax (per person per day, to be carried out by the tenant 2 EUR). Parking (per property per day, included 0 EUR).